Miguel Peidro was born in 1950 in Alcoy, Spain. He received artistic training at a private studio alongside very well known Spanish Masters such as Vicente Moya, Alex Alemany, and Juan Ferri. Being in the presence of such talent, Miguel was inspired to learn as much as possible and did so within a 5-year period. Miguel Peidro holds a special sensibility and awareness towards nature that clearly resonates in his work. Upon viewing Peidro's landscapes, one cannot help but get caught up in the quiet and meditative portrayals of his native Spanish land. 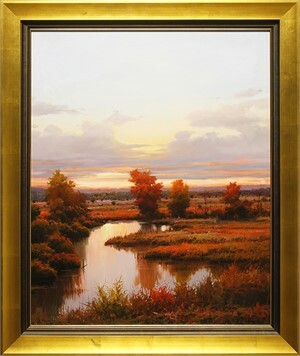 His choice of panoramic format accentuates the landscape and invites the viewer to partake in the artist's vision. Miguel's passion for both painting and nature elegantly intertwine with colour and light to create a reality that goes beyond. In the artists own words "My passion for both painting and nature are mixed within myself. This is the reason I paint landscapes. I find much inspiration in taking nature walks during my travels throughout Europe. I'm not interested in current art trends, I just paint what I like." Miguel Peidro has exhibited extensively throughout Spain, Europe and Japan and his works are included in private collections around the world. Miguel comments: "If you do not know my work and if it wasn't for the Internet you may of just heard of me for the first time, I would ask that you contact me to present your views, wishes and questions. I am at your disposal".